The BusPro-I has all the power, flexibility, and features you need to monitor and debug the I2C bus circuitry on your board. 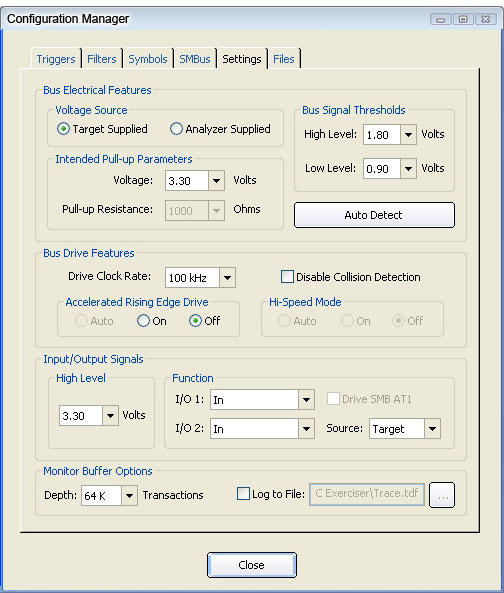 The BusPro-I can be used to monitor and log I2C bus traffic in real-time, generate I2C transactions to communicate with peripheral components on the bus, and in-system program I2C compatible EEPROMs. Because of its rich feature set, reliability, portability, and ease-of-use, the BusPro-I can be used in a wide variety of applications, such as product development, prototype validation, troubleshooting, system integration, production, and field testing. 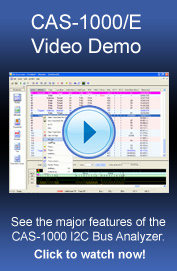 The Windows® XP/Vista/7 I2C Exerciser host software included with the BusPro-I provides a user-friendly GUI control and visibility of the BusPro-I, including set-up, options, and traffic visibility screens. I2C Monitor: Passively listens and records all I2C bus traffic while displaying real-time data in both state and waveform timing windows. By using the computer hard drive for trace storage, the BusPro-I has virtually unlimited trace data recording capability. message filtering, symbolic translation, and event triggering are all included. During capture, bus signal validation and protocol conformance are continually evaluated with deviations flagged. An example screenshot of the monitor window is shown below. 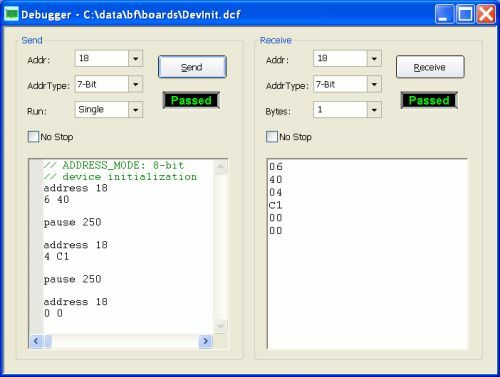 I2C Debugger: A user interactive bus I/O access portal. The debugger enables individual bus transfers for immediate target communications. Looping supports repeated I/O patterns to facilitate external signal observations. Besides generic writing and reading of data blocks, a growing library of standard devices is included showing interactive screens tailored to the device's organization (such as ADCs, DACs, flash memories, SMBus behavior, etc.). 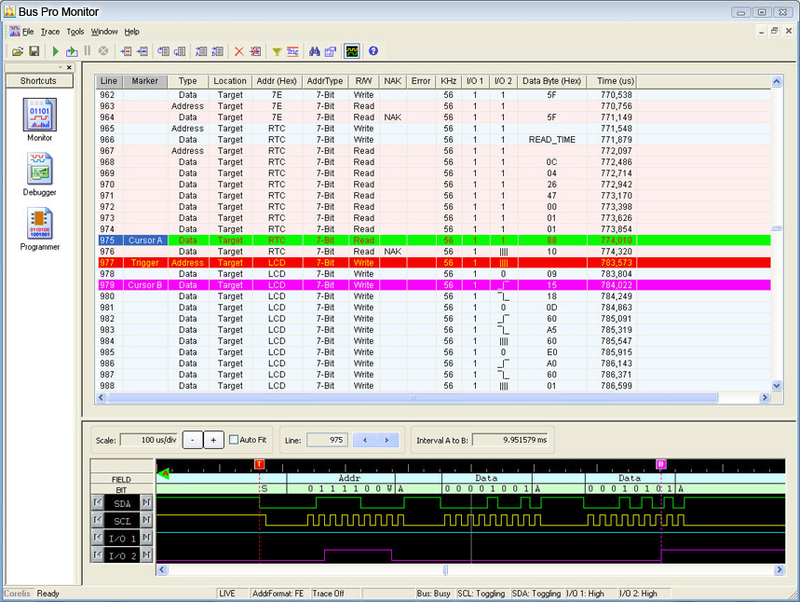 An example screenshot of the debugger window is shown below. 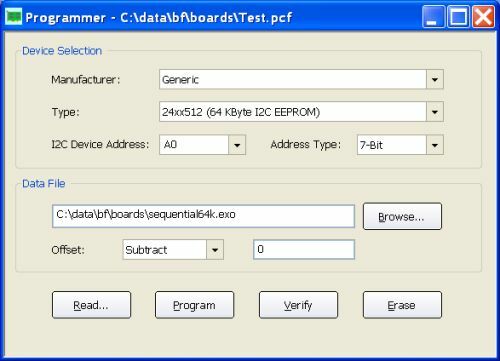 I2C Programmer: Provides easy-to-use high-speed in-system programming of I2C-compatible serial EEPROMs. Two example screenshots of the programmer windows are shown below. At the core of the BusPro-I is an on-board engine whose logic performs the low level interaction with the I2C bus. This element receives set-up, direction, and drive data from the host via a USB 2.0 port. Conversely, as bus activity is detected and characterized, its transitional information is conveyed up to the host for further processing. Two programmable lines can be operated under PC host software control. They are available to stimulate the target system or sense target conditions in coordination with the testing. 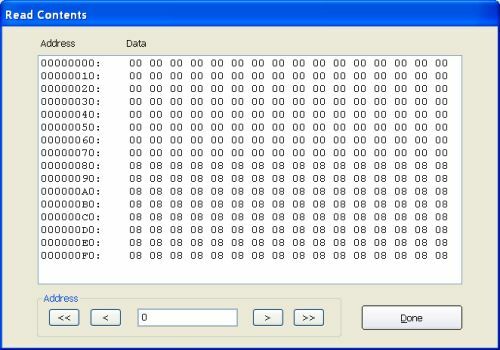 Each line is programmable as input, output, or output open-drain. One of these outputs can be used as a dedicated trigger to synchronize with external laboratory equipment. A second discrete I/O can be used as an input trigger. The voltage levels of the discrete I/O and trigger lines are programmable from 1.25V to 3.3V in increments of 50mV. The I2C bus reference voltage can be programmed as target driven through its bus pull-ups or driven from the BusPro-I analyzer. This target reference voltage can also be measured. When the BusPro-I is programmed to source this reference level, the voltage can be set with 100mV resolution over the range of 0.8V to 5V. When the BusPro-I reference voltage drives the bus, one of a set of pull-up resistors can be selected. The resistor values span the range from 250 to 50K ohms. Additionally, individual threshold levels can be adjusted for sensing high and low conditions on the bus. This supports I2C bus hysteresis requirements. * Note: The I2C bus is also often referred to as IIC bus, Philips I2C bus, Inter-IC bus, 2-wire bus, 2-wire serial bus, two-wire bus, or SMBus. This BusPro-I Whitepaper provides an overview and case study of how the BusPro-I can debug an I2C interface, quickly identifying the issue and ultimately allowing it to be fixed. While the BusPro-I is aimed at board level debugging, the more advanced CAS-1000-I2C/E hardware is intended primarily for I2C designers and test engineers who need to measure and validate parameters on the I2C bus. This hardware provides significantly enhanced functionality such as master and slave emulation, bus parametric testing, glitch injection, clock stretching, and timing skew. Click here for more information on the CAS-1000-I2C/E. 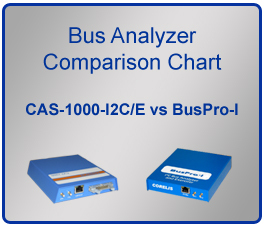 Visit our I2C Bus Analyzer page for a summary of the BusPro-I and CAS-1000-I2C/E products. 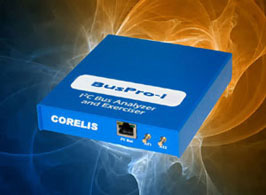 For complete information on Corelis Bus Analyzers, please refer to the detailed datasheet for this product. 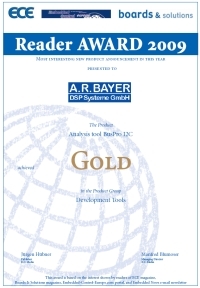 To speak with a Sales Engineer, please click here.